Tom McMahon: The Joy of Yiddish in Val Kilmer's First Movie Top Secret! 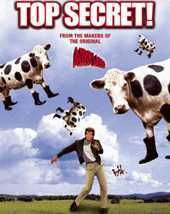 The Joy of Yiddish in Val Kilmer's First Movie Top Secret! The black conductor calling for tickets in ostensible German is actually reciting the old Yiddish saying, "May you grow like an onion, with the head in the ground." The hotel in which the dance is held is called "Gei Schluffen." In Yiddish this means "go to sleep." The waiter who asks if Nick is ready to order, ostensibly in German, is actually using the Yiddish curse "go take a s**t in the ocean". In the restaurant scene, when Hillary places an order with the waiter in apparent German, she's actually speaking in Yiddish. A rough translation of her line is, "Go bash your head in."